5 a.m. Hotel near Phoenix Sky Harbor International Airport. I left Cave Creek Canyon for the winter yesterday at dawn. Rain was falling and the surrounding peaks had a beautiful dusting of snow. One week ago was my last day hosting at the VIC. I was happy that I had the most visitors and highest merchandise sales of the month during my final shift. It has been such a pleasure to share my passion for the area and wildlife with birders, hikers, campers and others who are fortunate to enjoy the breathtaking beauty of the Chiricahua Mountains. My final day numbers had already eclipsed those of the previous days of the months before 3 p.m. rolled around and a surprise party for me inflated the visitor count. 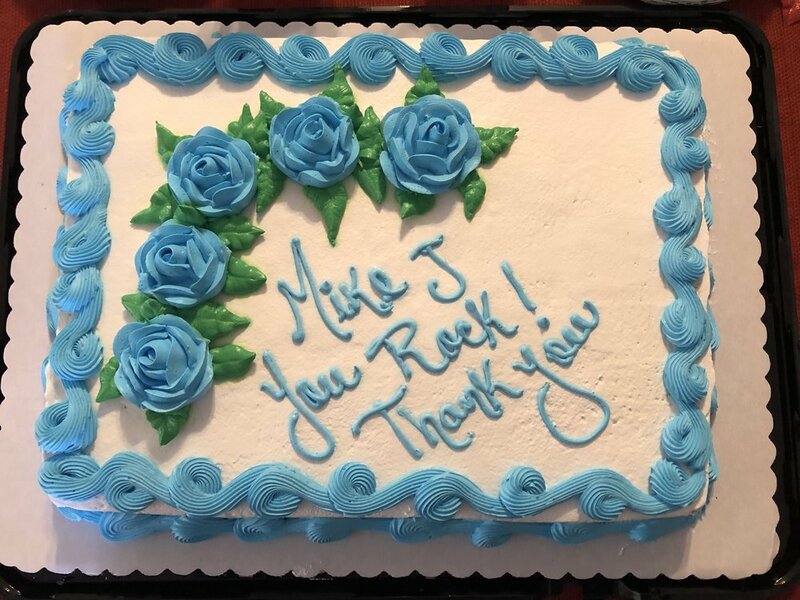 The entire Friends of Cave Creek Canyon [FoCCC] board plus spouses and other friends turned up to give me a wonderful farewell and thank me for my service. It only took the arrival of the first six or seven before it dawned on me that something was up. I was presented with the 2018 Volunteer of the Year award and paid registration for next year’s Biology of Pitvipers 3 Conference, and Vice President and VIC Manager Mike Williams proclaimed me “the best volunteer” they have had. Bob & Sheri Ashley, owners of the Chiricahua Desert Museum and Eco Publishing, who also serve on the board, gave me a signed Tell Hicks print of three Brachypelma tarantulas. Then two dozen people or more, including a few volunteers from the VIC and Forest Service, had cake and milled about as other visitors continued to arrive and I went from celebration to information. For over seven months I lived and worked and played in the northeastern Chiricahuas and there will only be a three month break before my return. 2018 was full of amazing experiences, many of which were recounted here. I am grateful to FoCCC for the opportunity, and it was very kind of them to acknowledge my efforts as they did. I look forward to my 2019 adventures in Cave Creek Canyon and continuing to play a role in the FoCCC mission of “inspiring appreciation & understanding of the beauty, biodiversity & legacy of Cave Creek Canyon”. Friends of Cave Creek Canyon is non-profit all-volunteer organization that was chartered in 2011 by passionate residents of the Portal, Arizona and Rodeo, New Mexico community, and has individual, family and business members from all over who contribute to FoCCC efforts in this enchanting canyon. As I prepared my Wheelhouse for winter storage over the past week, the U.S. Forest Service brought three horses and six mules to the corral where I was camped for over six months. The mules must have had draft horse dams as they are huge! I enjoyed watching them graze on the hillside before I left. Thursday I brought my parrot Jesse to stay with Carol who is in charge of the FoCCC educational outreach and is introducing students to the wonders of Cave Creek Canyon. Jesse will stay with Carol for eight days or so while I am in the Phoenix and Tucson areas with Brent Hendrixson who arrives at the airport here in Phoenix this morning. Friday morning I woke in the pre-dawn dark to rain and once the sun rose I saw that the higher peaks surrounding me had been dusted with snow. I had no choice but to put on my rain jacket and load my truck and hitch up the Wheelhouse. It was just after 7 a.m. when I pulled out of the canyon for the year and headed to breakfast at the Rodeo Cafe. Then I dropped the RV off at Rusty’s RV Ranch for 90 days of storage and headed to Phoenix by way of Tucson. So here I sit in a Phoenix hotel before sunrise. I will be in hotel rooms for the next ten nights as Brent & I search for late fall-winter breeding tarantulas before I drop him back at PHX on December 8 and make my way back to Chicagoland via a return to Portal to pickup Jesse and then Las Cruces, NM, Elk City, OK and Rolla, MO. December 11 I expect I will be dining at my favorite sushi restaurant in South Barrington, Illinois with Joel and wearing my North Face parka.